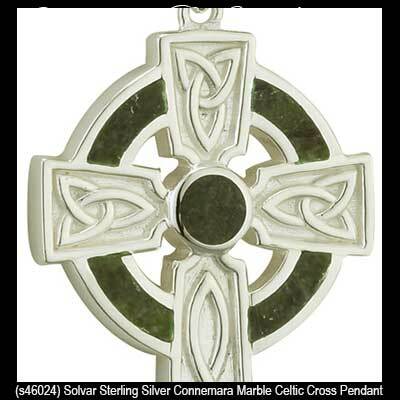 Men's Celtic cross pendant features Connemara marble inlaid in sterling silver. This men's size Celtic cross necklace in sterling silver features inlaid Connemara marble and engraved Trinity knots with the engraved Celtic knots continued on the reverse side of this pendant. This Connemara marble cross measures 7/8” wide x 1 1/2” tall, including the jump ring and the chain bail, and it includes a 20” long sterling silver chain. This piece of Irish jewelry is gift boxed with Celtic cross, Celtic knot and Connemara marble history cards, compliments of The Irish Gift House. This Solvar necklace is part of the Fáilte Ireland Collection and is made in Dublin, Ireland. This men's Celtic cross has been hall marked sterling silver by the Irish Assay Office at Dublin Castle in Ireland. 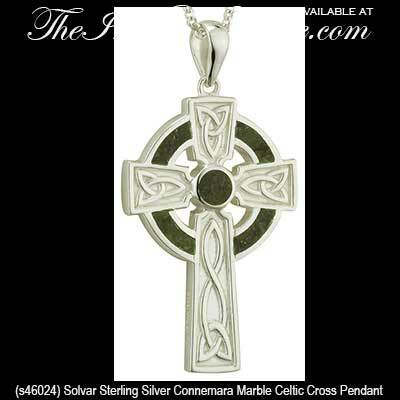 Men's Celtic cross features a heavy sterling silver necklace with engraved Trinity knots. Celtic cross pendant for men is cast in heavy sterling silver design that is enhanced with embossed knot-work. Men's Celtic cross necklace features oxidized sterling silver construction that is enhanced with embossed Trinity knots on both sides.